Habit of eating cold water and food. Wrongly cooked food, food that is not easy to digest or eating stale food. Not chewing food properly. Eating food at a fast rate, speaking and laughing while eating also let the air move in stomach. Your stomach enzymes and glands will not work normally if you are depressed or diverged during your meal. This can result in stomach gas as stomach is directly related with brain. Diverged mind results in improper impulses from brain. Enzymes and other chemicals are not properly made. Moreover, watching television while you eat also creates stomach gas. Excessive use of tea also badly affects stomach. Alcohol destroys liver functions aiding in stomach gas. Immediately going to sleep after meal or taking meal late at night also causes gas. Typhoid and gout are also causes of stomach gas. Some times food remains in stomach for long time. This undigested food began to stale and decay producing undesirable vapors and gases. Weak defense system in men and women is also a main cause. Patients of constipation also experience stomach gas as their intestine do not show necessary movement required for outflow of stool. Long stay of undigested food in intestine results in production of gases. These vapors then rise towards chest and brain causing pains. Eating oily food, spicy food, chicken , beef, sweets, bakery items, stale food, refrigerated food- they all contribute in stomach gas. Old age people are most prone to stomach gas. Diseases related to large intestine and patients of piles experience stomach gas regularly. Starch containing foods especially rice and some lentils causes stomach gas. Lactose sugar is also known to cause stomach gas. Milk, cereals, ice creams and bakery items contain large amount of lactose. Some people do not have enough enzyme lactase to digest lactose. Fats and protein cause little gas. The body may not be able to digest food substances in intestine due to unavailability of enzymes. This undigested food moves to large intestine where harmless bacteria break down the food substances releasing gases like hydrogen, nitrogen and carbon dioxide. Foods that produce gas in one person may not do same for others. This is due to the balance of harmful bacteria in intestine, for example, hydrogen produced by one bacteria can be destroyed by an another bacteria. The amount of bacteria present in colon is also a determining factor of stomach gas. Sometimes these harmful bacteria spread into the small intestine, where they start digesting food themselves instead of allowing small intestine to do it. Again, this results in production of gases like hydrogen. There are a dozen more causes of stomach gas but the above points cover 95% of the main root causes experienced in patients. 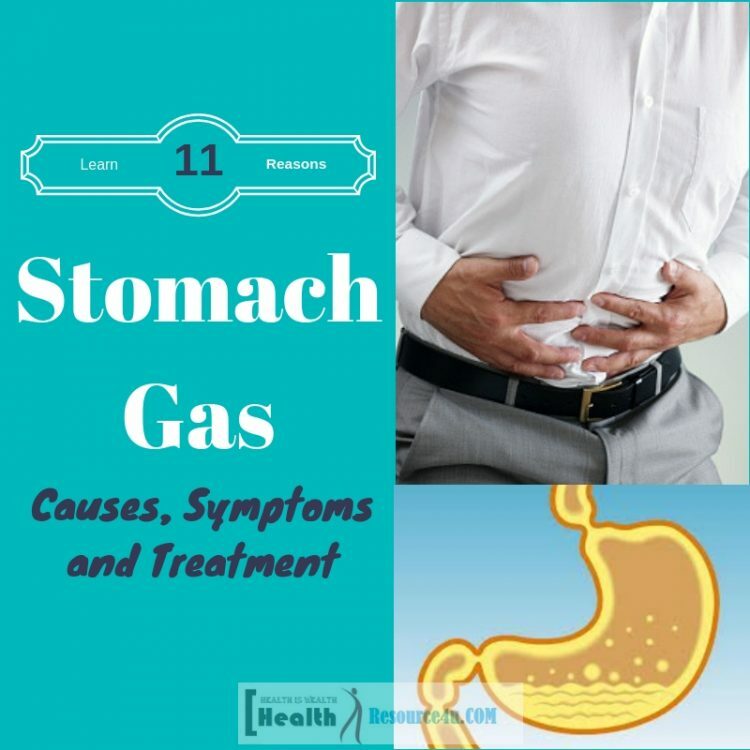 Following are the symptoms, treatment and preventive measures to avoid stomach gas. If acidity increases in stomach, the patient can’t resist hungriness. Stomach swells. If improper liver function is causing stomach gas, then after meal you will fell your stomach heavy and gases will began to develop. Pancreas in body releases bile which is used in digestion of fat. Bile prevents constipation and aids in outflow of stool. Less production of bile on some men causes difficulty in releasing stool resulting in stomach gas. Such persons usually have colorless stool. Irregular heart beat and feeling dizzy. Pressure of gases on intestines and vessels causes frustration and feelings of nausea. Severe condition can result in high blood pressure and doctors misjudge the patient condition. They prescribe medicines related to hearted problems thereby further destroying stomach. Treatment and how to prevent stomach gas? Don’t use medicines and hakim’s herbs. If gas is due to acidity it can further worsen your situation. This also applies to ulcer patients. Analyze your eating habits and change them accordingly. Use light and easily digestible food like soup of meat, chapatti etc. If your stomach feels difficulty in digesting milk, add a little aniseed, boil and then drink it. You can also add a little sugar before boiling milk and taking it. In this way milk will not cause gases. Eat seasonal food. Avoid sour food and cola soft drinks. Take honey daily with breakfast. Exercise on daily basis especially after sunset or early in the morning. Set a time for your meals and observe the time table strictly. Avoid talking and watching T.V during eating. Save yourself from tension, depression, sadness and other mental disorders. People suffering from acidity should take light food like banana, cucumber or any other fruit in between their two meals. Concentrate on your sleep and abstain from drinking water immediately after meal. Wait for atleast an hour. Decrease use of spicy food and meat. For treatment, an easy herbal solution is to take equal quantities of aniseed(Sonf), dry coriander(dhania), cardamom(Elachi) and blend them separately. Add an equal quantity of candy sugar. Save this mixture in a container and take a spoon after your lunch and dinner every day. In worst situations, enzymes lactase needed to digest lactose is taken in liquid form, usually along with milk. Lactase tablets are also chewed to serve the same purpose. Stomach gas is not a difficult disease to cure. The core thing is to identify the right problem and then move in right direction. People, even physicians mix up stomach gas pain with heart problem. Such wrong diagnosis some times results in serious consequence for patients. Only a proper and experienced physician can help you diagnose the right problem.